With well over 80 years of Karate experience between them, our three Senseis are all CRB checked and qualified black belt instructors. Sensei Tim Griffiths holds a 5th Dan black belt in Shotokan Karate. 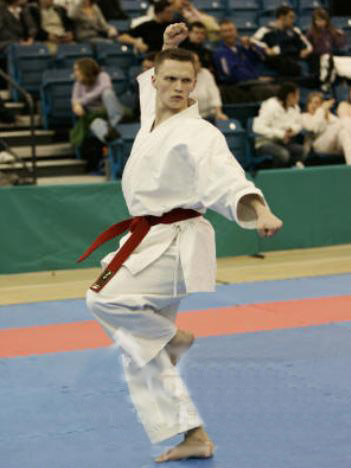 He became a qualified instructor in 2001 and was a member of the national kata squad for 12 years, under the auspices of Karate Union of Great Britain's Chief Instructor, Sensei Andy Sherry, 9th Dan. Tim began training in 1992, gaining his black belt four years later. Since then, he has trained with some of the most renowned names in Karate, including Senseis Enoeda, Asai, Kanazawa, Abe, Sherry, Kagawa, O'Neill, Poynton and Brennan. Tim recounts some of his most special training memories from training outside of the UK, having trained for short periods at both the Japan Karate Shoto Federation (JKS) and the Japan Karate Association (JKA) headquarters in Tokyo, at the dojo of WTKO Chief Instructor Richard Amos Sensei in New York and also in Los Angeles under the tutelage of the late Master Nishiyama, one of the JKA's founders. Tim particularly appreciates the opportunity to train with some of today's inspirational new breed of instructors, such as former European champion, Sensei Matthew Price. In competition, Tim has had a number of successes at both regional and national level. He is current and 4 times KUGB Southern Region individual kata champion and has also been KUGB Southern Region individual kumite champion, twice team kata champion and twice team kumite champion. He was a national medallist at the Karate England all-styles National Championships, the British Universities All-styles Karate Championships and three times at the Shotokan Cup National Championship as well as a national team kata silver medallist at the KUGB National Championships (2014) and JKS England Open Championships (2015). In Open competitions he is the 2015 Legend Open Individual & Team Kata Champion and 2016 WTKO Team Kata Champion. As the Chief Instructor at Backwell Karate Tim continues to train hard to develop personally and also to keep bringing fresh ideas to students of the club. The founder of Backwell SKC, Sensei Bryan Gideon is proud to be a long standing member of the Karate Union of Great Britain with over 40 years of experience as a Karate practitioner and instructor. In recognition of his achievement, in 2014 he was presented with a special certificate at the National Indoor Arena, Birmingham, during the KUGB National Championships. 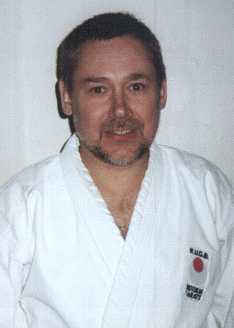 Bryan started training in 1973 at the Bristol Shotokan Dojo under Sensei Bill Winfield. Five years later he started Backwell SKC with Bob Padfield on the invitation of two teachers at Backwell Secondary School where the club used to train. It was in 1984 that he was awarded his shodan by the late Sensei Keinosuke Enoeda after 11 years of hard training. As an instructor, he has helped many of his students improve their karate considerably, having taught many of them from beginner to black belt. The highlights of Sensei Gideon's Karate career have been various. In the past he has enjoyed organising and taking part in Karate training weekends in Backwell School's holiday home. More recently seeing his students entering both local and national events has been something that he has taken great pleasure in. When asked about the club he said, "During my long association with Backwell Shotokan Karate Club I have met some exceptionally talented Karateka and have had the pleasure of helping them achieve their goals, but more than this they have become life-long friends." Sensei Devon Troskie became a core instructor at Backwell Karate in 2014 and is also one of two main instructors for our Bushido Warriors children's Karate programme. Devon started training in his native South Africa as a child in 1981. Over the course of ten years he developed his Karate under Senseis Rob Schmidt (SA JKA), Michael Roetz (JKA Dorfman, now KWF) and Les Stevens (SA JKA). This training led him to achieving Transvaal (provincial) colours, two regional championships and a silver medal in Junior Kumite at the SA JKA National Championships. 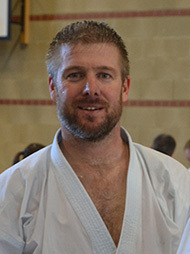 After a break from Karate and a move to the UK, Devon got bitten by the 'Karate bug' again and passed his black belt in 2009 before joining Backwell Karate the following year. Since joining Backwell, Devon's Karate has gone from strength to strength. From 2012 onwards, Devon passed his 3rd Dan under Sensei Andy Sherry (9th Dan, KUGB) and has placed at both regional and national competitions, having picked up silver at the KUGB Nationals and bronze at the JKS Nationals in Team Kata. At the KUGB Southern Region Championships Devon has twice become Team Kumite champion, once Team Kata champion and twice individual Kumite silver medallist. Devon started Karate as his father said he was a little 'wet behind the ears'. He is convinced that Karate had helped him build confidence and avoid being bullied, first at school and then as an adult. As an instructor of the Bushido Warriors programme it has given him great pleasure to see children develop in the way he did in his early years. And now as a regular instructor of the core classes club members benefit from his experience and disciplined approach to Karate. Devon's future goals? To keep developing his own Karate while helping to develop the next generation of Karateka at the club.